Muscular and musculotendinous rheumatism syndromes of both scintigraphic and radiographic interest include myositis ossificans, rhabdomyolysis, musculotendinous unit injuries, and distal femoral cortical desmoid. Myositis ossificans denotes a condition in which the skeletal muscle is heterotopically ossified. The ossifying myositis caused by trauma is referred to as myositis ossificans traumatica and that unrelated to trauma is called myositis ossificans nontraumatica or pseudomalignant osseous tumor of soft tissue. According to Soule (1945), this condition is noninflammatory in nature and due to the alteration of peri-mysial connective tissue (fascia) and not the myocytes (muscle). It is generally accepted that the perimysial tissue, which induces the osteo-progenitor cells, is the source of heterotopic ossification (Friedenstein 1973). 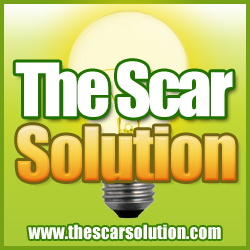 The causes include trauma and surgical damage in myositis ossificans traumatica and burns, paraplegia (Miller and O'Neill 1949), and autosomal mutation in myositis ossificans nontraumatica. 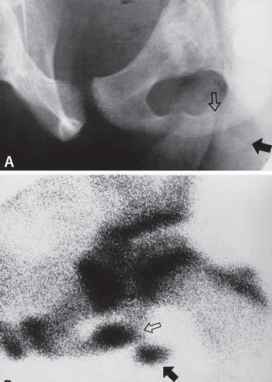 The third type is myositis ossificans progressi-va. This is a rare inflammatory disease of mesodermal tissue; hence, it also referred to as fibro-dysplasia ossificans progressiva. progressiva is basically different from that of the other two types of myositis ossificans, and is characterized by diffuse sheet-like ossification that often connects different parts of the body such as the shoulder, rib cage, and pelvis. vity of a calcifying lesion in its evolutionary stage. Understandably, fresh lesions accumulate tracer far more avidly than old ones (Figs. 12.38B and 12.39B). Myositis ossificans may result from a surgical incision or an operative injury of skeletal muscles (Fig. 12.41). Incisional soft-tissue wounds accumulate tracer well within a week following an operation (Fig. 12.42), and mineralized foci may be presented as areas of discrete uptake of 99mTc-MDP within a few weeks (Fig. 12.43). Nuclear angiography and equilibrium phase scintigra-phy are ideal for noninvasive dynamic assessment of activity of myositis ossificans in terms of mineralization or calcification (Fig. 12.44). generation, and regeneration of muscle fibers (Armbrustmacher 1988). When muscle fibers disrupt, myoglobin escapes into the extracellular fluid and plasma, resulting in myoglo-binemia, frequently causing acute renal failure. Plasma creatine kinase is elevated. In contrast to myositis ossificans, in which perimysial connective damage prevails, myocytes are mainly affected in rhabdomyolysis. Clinically, half of the cases are indolent, and in the majority of cases objective symptoms and signs are absent (Gabow 1982). 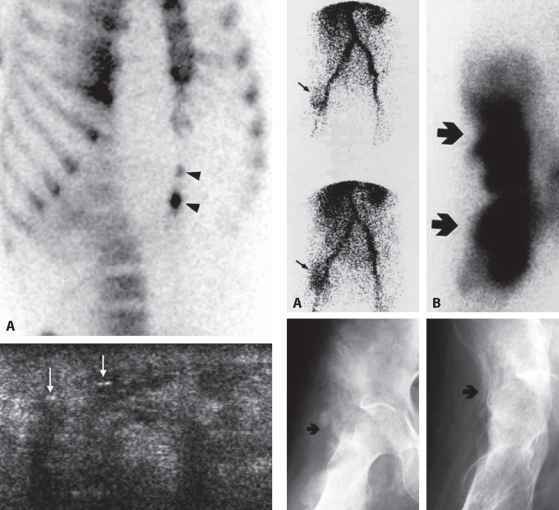 Radiography is not helpful in the diagnosis of rhabdomyolysis, although it can be utilized to exclude inflammatory and calcifying muscular disorder (Fig. 12.45). CT is characterized by low attenuation in affected muscles (Fig. 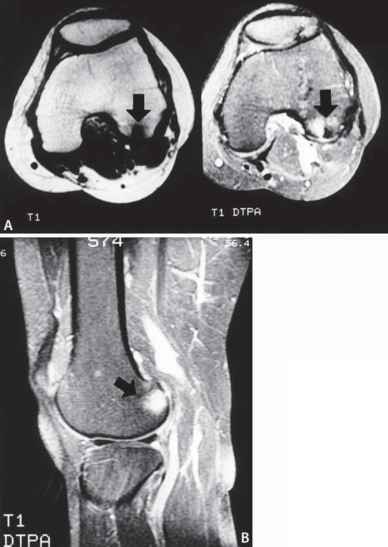 12.45B) and MRI reveals streaky or mottled high-intensity edema in necrotized muscles on T2-weighted images (Fig. 12.46C). 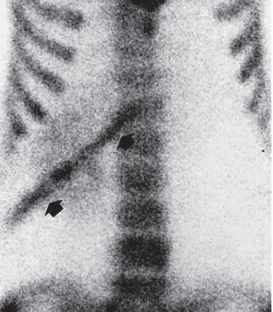 99mTc-MDP bone scanning has been widely used for the diagnosis of rhabdomyolysis since the first reports of Haseman and Kriss (1985) and Patel and Mishkin (1986). It is a highly reliable and sensitive examination. Procedures include whole-body scintigraphy for systemic survey (Fig. 12.46A) and pinhole scintigraphy for the identification of a specific muscle or muscle group (Figs. 12.45A and 12.46B). The musculotendinous unit is the portion of a muscle attached to a tendon, tendinous insertion, or enthesis, and strain is defined as a stretching or tearing of the musculotendinous unit (Baker 1984). According to the nature and extent of damage a strain can be graded as first, second, or third degree. The first grade indicates minimal stretching of the musculotendinous unit without permanent injury, the second grade partial tearing, and the third grade complete disruption of a portion of the unit. 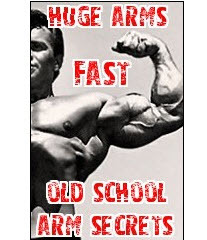 Among a number of musculotendinous injuries, rotator cuff syndrome, strain of the biceps muscle or triceps muscle, tennis elbow, De Quervain's tenosynovitis, and strain of the quadriceps femoris muscle and the gastrocne-mius-soleus muscle are well known. 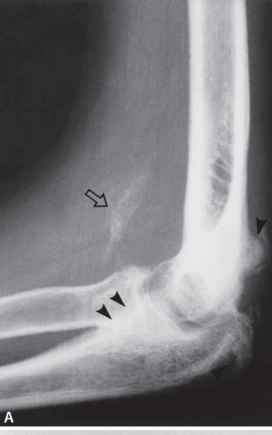 Soft-tissue radiography may be used to diagnose injuries in the musculotendinous unit. However, diagnostic yields are generally low and information is not specific except for calcification. Contrast arthrography can accurately delineate musculotendinous injuries and tendon rupture, especially in the shoulder, whose anatomy is complex. MRI, a noninvasive modality, is extremely useful for the investigation of soft-tissue anatomy and pathology (McNamara and Greco 1996) and sonography is increasingly used for the same purpose. 99mTc MDP bone scanning is another noninvasive method. It can sensitively detect injured muscle and tendon. Unless injuries are negligible, pinhole magnification can nearly always show increased uptake of various degrees, identifying the specific muscle or muscle group damaged (Fig. 12.47). Distal femoral cortical irregularity, also known as cortical or periosteal desmoid, is characterized by concave, convex, or divergent irregularity of the cortex in the popliteal surface of the distal femur and the epicondyle. One of the first descriptions is due to Kimmelstiel and Rapp (1951). Typical sites of involvement are the attachment of the gastrocnemius muscle head, mostly the medial one (Suh et al. 1996) or adductor magnus muscle. It is not a neoplasm but a traumatic lesion of the musculotendinous unit (Resnick and Greenway 1982), and is considered by some investigators as a variation of ossifying periostitis (Mirra 1989). Pathologically, the condition is characterized by fibrin with mineralization, suggesting a reparative process. In one recent series, the average age of the patients was 34 years, ranging from 4 to 64 years (Suh et al. 1996). The lesions may cause pain in occasional cases. 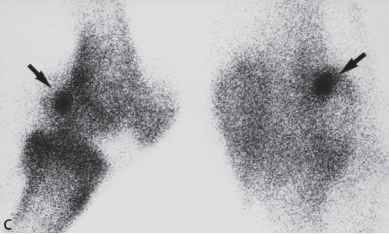 Radiography shows cortical irregularity that is usually subtle and unimpressive (Fig. 12.48A). However, MRI can clearly show convex or concave aberration or the combination of both. To be exact, MRI of the concave type reveals a well-defined area of low signal intensity on T1-weighted images, which becomes enhanced with administration of gadolinium DTPA (Fig. 12.49A, B). We have performed pinhole bone scans in three patients with this condition: one patient showed ill-defined patchy uptake in the popliteal surface of the distal femur (Fig. 12.48B), and two patients showed well-defined roundish uptake (Fig. 12.49).